There have been numerous changes in cataract surgery over the years,many of which are recent, which allow better visual acuity following surgery. Ultrasound (phacoemulsification) removal of cataracts is a rapid and relatively painless procedure that allows patients to return to normal activities almost immediately. The ultrasound breaks the cataract into billions of pieces as they are aspirated out of the eye. 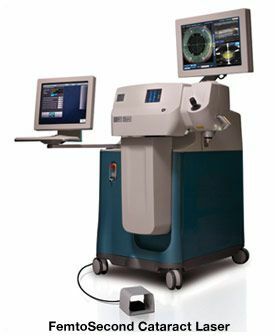 FemtoSecond Laser-assisted Cataract Surgery is the latest technological improvement that allows the surgeon to perform many of the manual portions of the cataract surgery with a high-speed infrared laser (each pulse firing for only one millionth of a billionth of a second! ...a femtosecond). These new laser portions of the surgery include the corneal incision to gain access to the inside of the eye. Reshaping of the cornea with precise depth and shape incisions to reduce astigmatism, and the removal of the front surface (anterior lens capsule) of the crystalline lens that contains the cataract. In addition, the FemtoSecond Laser actually softens the nucleus (the inside portion) of the cataractous lens allowing the cataract to be suctioned and removed from the eye more efficiently with less ultrasound energy for the patient. It is becoming more and more routine for Dr. Duffey to correct astigmatism with the FemtoSecond Cataract Laser and to correct presbyopia with premium lens impants during cataract surgery. Following lens removal a soft, foldable intraocular lens (IOL) is inserted into the eye. There are many types of lens implants including presbyopia-correcting lens options which simultaneously provide distance, intermediate, and near vision. Toric lenses can also be implanted which will reduce even larger degrees of astigmatism. Typically the femtosecond laser incisions placed in the cornea to reduce astigmatism are infinitely thin allowing the cornea to heal rapidly with almost no discomfort. Antibiotic and anti-inflammatory drops are used following surgery and patients are asked not to swim or get hit in the eye for one week after surgery.